Once a child reaches 9 years old they can start moving from Little Athletics to Juvenile athletics. These years are an important time in a child’s development and the aim of Little Athletics is to help children develop agility, balance and coordination in a fun environment. Once a child and coach feel ready to move onto Juvenile athletics they will do so usually at the age of 9 or 10. 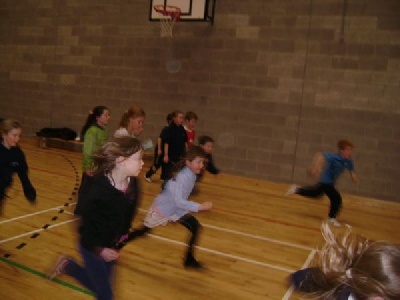 Little Athletics is held on a Thursday and sessions last an hour, during which, the children will work on running, throwing and jumping (and develop their natural fitness and endurance in the process). The club welcomes all children regardless of ability. We believe all the children will benefit from the activities. Even if they never compete in athletics (or any other sport), the fundamentals will be of benefit for all their life. At this age competition is not a priority but it does help to teach children how to cope with challenges. Competition consists of cross country before Christmas, indoor track and field in the spring and outdoor track and field in the summer, all are optional. No sugary snacks/ crisps at training or competitions please. It is a good idea to give your child a bottle of water. It is also a good idea for them to have a snack soon after training, preferably a healthy one. Juvenile Athletics in Ireland is defined by age groups, from Under 9 through to Under 19. A child has to be under the defined age for the full calendar year. In DSD we believe in training hard and competing hard, while having fun and enjoying ourselves. This ethos has resulted in many of our former juvenile athletes making firm friendships during their juvenile years which, in many cases, have outlasted their interest in the sport itself. Many of our senior athletes, including most of our international standard senior athletes, joined our club as juveniles. Athletes generally train with athletes of their own approximate age, this is for social reasons as much as training reasons. In general, training intensity increases with age and fitness, and our coaches are watchful of individual capability and manage the training sessions so that athletes of different abilities are stretched according to their ability. As athletes get older they will steer more towards their preferred events and training becomes more specialized depending on the preferred discipline. DSD caters for athletes across all running categories from marathon to sprints as well as hurdles, jumps and throws. Any parent should feel free to offer if you would like to get involved in a session. You can supervise part of training on an ad hoc basis or give a greater commitment. If you would like to get more involved, let us know.